Well, some drywall. And it hasn’t been taped and mudded yet. But hey, it’s progress! I love it! We have our 1800’s home being renovated, slowly, and you’ve done more here than our contractor has done in 2 1/2 months. Kudos! You’re making great progress, I’m impressed! 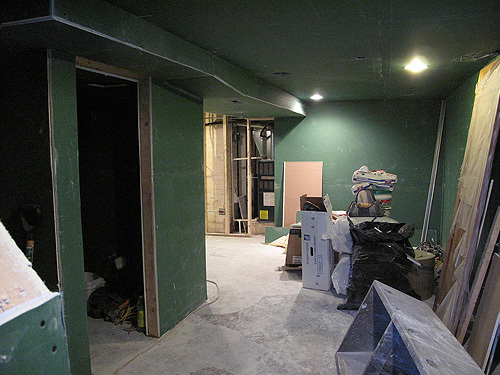 Is it green because it’s a special kind of drywall for the basement? I’ve never seen such dark green drywall before. Yes, the drywall is dark green. Isn’t that odd? I’m not sure why that is – I haven’t checked it out. I suspect it has something to do with basement use (humidity/wetness prone)? Was the window always there, or did you add it? Love seeing the progress. I’m craving some remodel at my home, but I have to live vicariously for now. 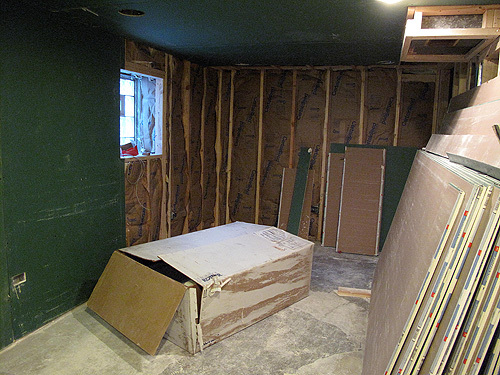 yes, green board is for damp areas, bathrooms and basements. Sign of a good contractor that they didn’t offer it as an option, just put the right stuff in to start. 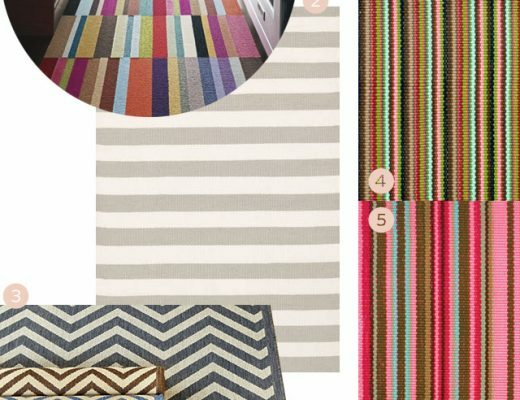 Thought of you and this project this weekend–looking good! And yes, I used greenboard for my bathroom remodel because of the moisture. I agree with Kathryn…it sounds like you have yourself a good contractor! And in such a lovely green color! Looks great. Did you share the overall square footage of the basement in any of these posts (I can’t find it). Also, what is the ceiling height? Can you talk at all about your process in beginning this? We want to do our little basement and I was told we should start with an electrician since we’ll need wires run up for overhead lighting. I’ve been watching these posts like a hawk! It’s about 600 sq. ft. and the ceilings are about 7′ high. We hired a contractor (a first for us!) who has been great about handling all of the details. He has brought in a plumber, electrician, floor leveling guy, a heating/ductwork guy, and drywall hangers. Their work has all kind of overlapped, but the general progression was framing (studs), leveling the floor, moving and replacing pipes, moving ducts, updating electrical, more plumbing work, insulation, and now drywall. Aah, I just love a good During. Thank you!! Interesting note about the green drywall, I was going to ask the same. I also thought it was something organic… silly me. Like others, enjoy watching the progress. 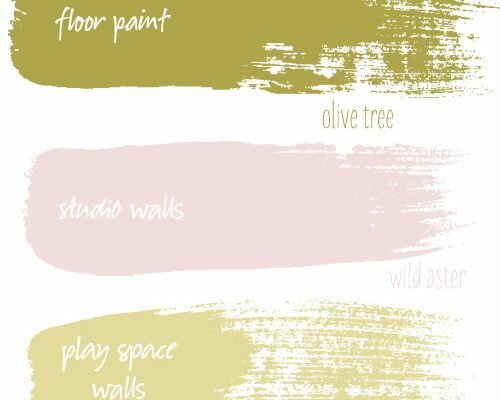 One question — did you use an architect to design the space, or just your contractor? We’re beginning a basement project and are getting mixed advice from friends. I had a pretty good idea of how I wanted to lay out the space (I studied architecture for a couple of years), and the contractor had some ideas too. Are you doing all the work yourselves? I may have missed that… Yes, what is your ceiling height? Normally we’re all about DIY projects (we’ve put in flooring, redid our kitchen, etc. ), but this was beyond our skill level. We hired a contractor to make sure everything is up to code and a lot of the quirks of our hundred-year-old house needed to be taken care of. The ceiling is about 7′ high. great inspiration! we are starting our basement sometime soon, hopefully. can’t wait to see what’s next! Congrats! This is so exciting, I am dying for the finish! This is great! 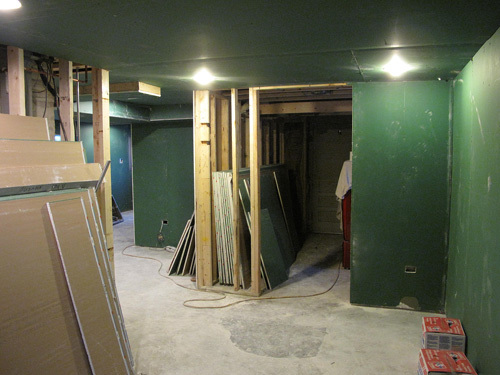 I hope to start our basement soon, so I’ll be watching your site for your progress. Good luck! Congrats! This is soo exciting! I can’t wait to see what you have in store! Please tell me that you are taking notes for a comprehensive write up of this process? I have freinds with a similar basement and I told them about you. I understand that with the new baby coming you may not have time to write it up in weekly installments now but if you take notes it might be easier to write it after the baby is born. Thank you for the pictures though!